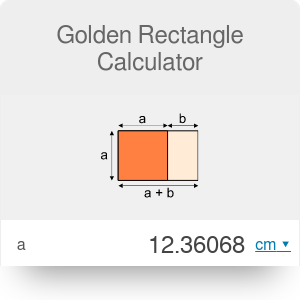 Golden rectangle calculator determines the missing side and area of a golden rectangle. The golden rectangle calculator will calculate the length of either side and the area of the golden rectangle given the other side. Before we use the calculator, we should understand what the golden rectangle, how to calculate ratios in general and the formula for the golden ratio. The golden rectangle is a rectangle whose sides are in the golden ratio, that is (a + b)/a = a/b, where a is the width and a + b is the length of the rectangle. The ratio calculator is an effective tool to assist in calculating ratios in general, while the golden ratio calculator will do the same as the golden rectangle calculator with the exception of finding the area of the rectangle. If you know the area, divide by the missing part to get the other part. Check your answer with the golden rectangle calculator. An interesting aspect of the golden rectangle is that when a square section is removed, the remainder is another golden rectangle. The golden rectangle calculator will verify this result. Golden Rectangle Calculator can be embedded on your website to enrich the content you wrote and make it easier for your visitors to understand your message.